A home beyond a king’s. To the casual visitor, my little home community of Arcadia wouldn’t seem like much. We have no post office, no stores, no elected officials, and no stop lights. 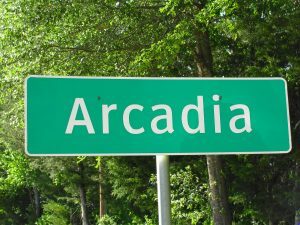 We do have two small green road signs that say “Arcadia” as you pass through. We have the Arcadia Church of Christ, across from the Powdrill Cemetery where half of my relatives are buried, including one set of grandparents, great-grandparents, several great-great grandparents, and my Powdrill great-great-great grandparents. We also have the small brick Newbern Masonic Lodge, chartered in 1889, where my grandfathers, great grandfathers, great-great grandfathers, and great-great-great grandfather Harvey Jones where all members. The little metal Golden’s Grocery closed down in 1985 while I was a freshman at Texas A&M. I have the Arcadia population posted on the sign in front of the store at 57. That’s counting everybody from the “city limits” my Granny Ruth recorded years ago…from my half cousin’s, Annie and Lee Patterson’s old homeplace on the east; to my great-great grandparent’s, Etta and Johnnie Jones old place on the west; and from my half cousin’s Earline and Ernest Crawford’s place on the south; to Doyle and Alcine Johnson’s old house on the north. We aren’t terribly scenic here. Other than off the back of my parent’s 500 foot hill and a few spots along West Creek, there aren’t any breath-taking views or virgin forests. We don’t have a single historical marker. But with or without her warts, I’ve always loved Arcadia. I don’t know who named her, but for me it was prophetic. The name Arcadia is from Greek mythology, literally a pastoral “heaven on earth”. I think it’s where Pan ran around playing his pan flute. It’s the same root source of Acadiana and Cajun. Ever since I was a child, Arcadia has been my heaven, my refuge. Although I was born in Tyler and raised in Longview, we made frequent weekend trips to “the farm” because my dad raised beef cows here. I was born to live in the country. I begged to stay with my grandparents and not come home. We spent most of our time with our maternal grandparents, Marquette and Eloy Emanis. We just called them “Grandmother” and “Papaw”. To everybody else they were “Coot” and Eloy. She called him “Shug” and he called me “Baby”, since I was the baby boy I suppose. My Grandmother Emanis was a hard working nurse, storekeeper, and cook. Sometimes I’d go to work with her when she was doing home health or acting as the staff nurse at the Holly Farms chicken processing plant. But mostly I’d run around with my Papaw. He was a farmer, store owner, hunter, yarn spinner, and all around entertainer. When we weren’t tending cows or working in the garden we’d play dominoes with Jewel Jones, my great-uncle; neighbor Albert Lily; and my Granny Ruth’s second husband, Andrew Mena. We played at their respective houses. Sometimes we’d play in the old Shelby County jail on the square in Center long before it was restored. I always knew I wanted to live in Arcadia. I always knew I was going to live in my grandparent’s old farm house. When my Grandmother Emanis told me it used to belong to her grandparents, Bob and Mary Pate, and asked me what would become of it once she was gone, I promised her I’d look after it. And that I will. I still garden in the same patch my Papaw taught me to garden. Though the spring drought was hard on my garden I still furrow irrigate down the middles just as he did. We received two rains in May of over an inch each, our first real rains since January. It saved us for a little while. I’m currently picking yellow squash (my mom’s favorite), cucumbers, and peppers (sweet banana, Tequila bell, and TAMU mild jalapeno). Thanks to the lack of rain, my row of tomatoes is plagued with blossom end rot. To make matters worse, my chicken got into them as well. I’ll make a decent crop however. My parents LOVE fresh tomatoes. This year I grew Floralina, Florida 91, and BHN 589. I have four nice rows of Sweet G-90 sweet corn that should be ready in June. I can’t wait. My top three favorite fresh vegetables are fresh shelled pinto beans, new potatoes, and fresh sweet corn dripping with real butter and sprinkled with seasoned salt and black pepper. My sweet corn is in the very same rows where I helped my grandparents pick it many years ago. One year my Papaw and I were cutting off “cream style corn” in the back yard under the old umbrella chinaberry tree when our noisy state bird positioned himself just above us. We had a huge dishpan full of creamy yellow fresh corn nearly ready to bring inside the old house where my Grandmother would package it and freeze it. Suddenly Mr. Mockingbird deposited a big magenta blob (certainly appeared to be pokeberry in origin). I’ll never forget the stark contrast of the purple blob against the yellow corn. In a split second my Papaw carefully scooped it out with his hand and kept cutting like nothing ever happened. I certainly never told. My husband and I are interested in building a modernized but functional version of a dogtrot house. However, we've not seen very many original dogtrot houses in person and were wondering if we could come see yours as part of our research. We live in Nacogdoches. Miss Rhonda, Howdy girl! Many thanks. Please do come to visit. There aren't very many former Arcadia residents left!!! PS: Golden's Grocery is still standing.